Use the MD Display properties to customize the appearance of MD Trader. Displays a popup tip when you hover the cursor over select fields. Controls whether or not the cursor displays the bold, yellow custom pointer for the selected order type. Highlights the best bid and best ask. Grays out when the order server is down. Disabled by default. Highlights the cell as your cursor rolls over it so you can identify where it is. You can customize the highlighting color in the MD Color tab. Displays MD Trader on top of other applications. Shrinks window to maximize your desktop space. Disabled by default. Hide Titlebar Buttons: Hides the zoom buttons that normally display in the titlebar. Enabled by default. Hides the zoom buttons in the titlebar so product names can be easily read. Uses custom colors to indicate in the MD Trader® price columns that a bid price or ask price is not available. Disabled by default. On the Colors tab in Properties, these colors are listed under MD Trader | Bid Side | Unavailable, and MD Trader | Ask Side | Unavailable. This property lets you choose how the quantity of the ¼ 32nd price displays when it is available. Displays entire quantity at the correct tradable price, rounding bids down and offers up. Displays the entire quantity, rounding bids down and offers up, with an asterisk ( * ) next to the closest price. Enabled by default. Creates secondary bid and offer columns to display the quantity based on implieds. These columns display in the same color as Bid and Ask columns, but display the better quantity in a smaller font. Aligns the text in the Buy column to the right or left. Aligns the text in the Sell column to the right or left. Enables the view of traded contracts in the Last Traded Quantity column. 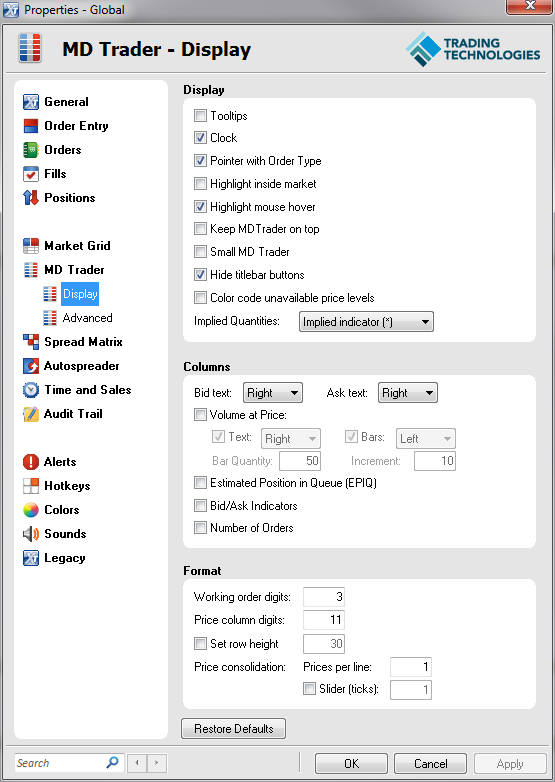 MD Trader generates and displays approximate values. They are not guaranteed to be the exact trading volumes for any given trading period. Incorrect or under-reported actual volume may occur due to price consolidations at the exchange or Gateway levels. Displays the Bid Indicator column and Ask Indicator column, used for pasting Excel links. Displays the number of orders associated with each reported market depth quantity. Sets the number of spaces between the letters and numbers in the working order quantity column. Sets the number of digits displayed in the price column. Right side digits are truncated. Sets the height of each row in pixels. Note: You can also consolidate prices using the Price Consolidation slider. See the Slider Control property. Shows a slider control that consolidate prices by the number of ticks set in the Tick Increment property.